Mission 1: Fight dangerous enemies in the ice caves of snow-capped mountains to retrieve a rare artifact. Mission 2: Fight waves of enemies while riding an unusual vehicle with Hurk by your side. Mission 3: In this epic bro-tastic conclusion, chase down an enemy convoy and save Hurk from certain death. Exclusive Weapon: Harpoon gun “the Impaler”! The Limited Edition is a “First Edition” pre-order only release, meaning that all pre-ordered copies of Far Cry 4 get a free Limited Edition upgrade. This entry was added to the database on Friday, May 16th, 2014 at 3:49 am by Ayiu. This information was last updated on Friday, May 16th, 2014 at 3:58 am by Ayiu. 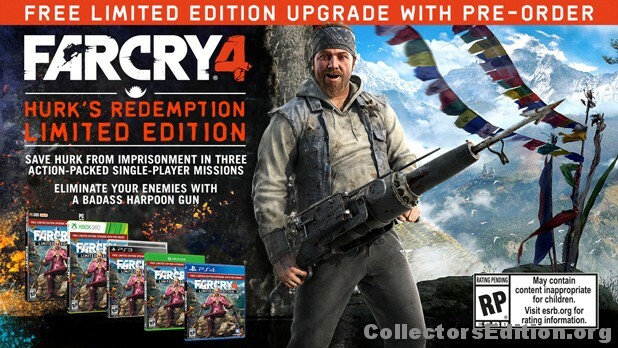 Far Cry 4 "Limited Edition" announced for NA, Europe & Australia. No news on a CE I take it? Anyone seen this steelbook outside of Australia yet? 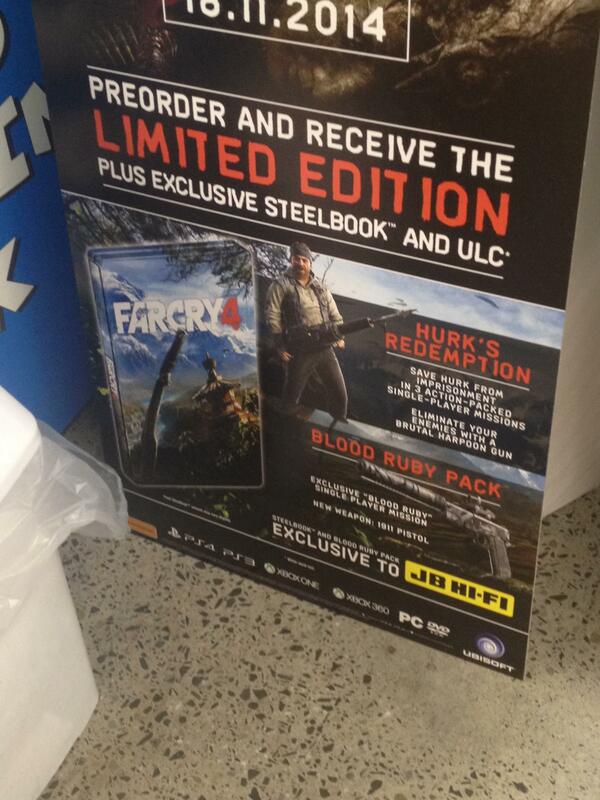 Damn, I want that steelbook. Me too, but it costs nearly as much as the kryat edition! Unless you're buying it overseas it's $150 for the Kyrat, and for this it's $95 for next gen, $85 for last gen. I picked up the kryat edition for $120 delivered at zavvi. I'll probably get this and then sell the game separately. There is Ultimate Kyrat Edition available at Ubisoft shop, but I'm afraid the case quality will be appalling compared to Steelbook. Am I the only one who would love having a possible replica of...? Is they a separate thread for the Kryat edition ? Well on the basis that this is probably a one stop 'Far Cry 4' shop I'll say my ultimate Kryat edition arrived sans metalpak and no season pass e-mail. I've already contacted ubisupport. I'm trying to decide on whether to get this or persona Q....why do I have no money. WHY? Luckily I cancelled the Kyrat Edition early and didn't bother preordering locally for a WHOPPING $150 from ubishop. I'll just wait for this to drop below $50 to grab it for cheaps.